Outdoor furniture repair kits come with several pieces to fix an array of problems that can arise with furniture items that are used outside and subject to UV rays, rain, and wind. They can contain a variety of small tools, paints, glue, and even small furniture parts for a quick and easy do-it-yourself fix. It would probably be difficult to find a one size fits all outdoor furniture repair kit because there are so many different types of concerns when it comes to keeping patio or deck furniture functional and looking nice. For each minor problem, however, there is most likely a kit with which to fix it. If the vinyl strapping on your patio furniture has become worn or broken, consider a vinyl strap repair or replacement kit. Many of them come with everything you need to provide a quick fix. As long as the frame of the furniture is still fine, you can patch it up and get more use out of it without having to search for a whole new piece. At Chair Care Patio, you can find kits for 1.5-inch vinyl, 2-inch vinyl, and 2-inch textured vinyl that include a 200 roll of vinyl wrap, a rotary punch, utility shears, 200 rivets, measuring tape, and rubber palm gloves. Even if you do not have a basic tool kit, you should be able to find everything you need to make the repair. If you already have the additional tools you need, you can also purchase the vinyl strap alone. At Chair Care Patio, you'll also find replacement slings for your other chairs, miscellaneous parts for your furniture repairs, and more. Unless you've got a minor tear, you might be hard-pressed to find a kit designed to fix problem patio cushions. However, you may be able to use that sewing kit to make some new ones or at least stitch the covers back together once you cut new foam for them. If your cushions sag and are uncomfortable but your covers look fine, you could just replace that. If your cushions are still comfortable but the covers have seen way too much UV light and too many rainy days, you can remove the fabric and use your needle and thread to cover them with something new. 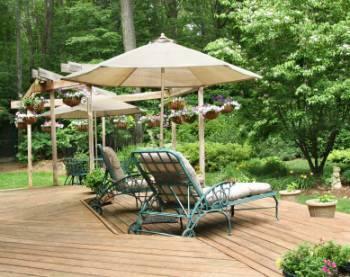 Sometimes only a part of your patio umbrella gets damaged or too worn to use anymore. In that case, you can purchase bits and pieces at A Good Strapping. You can get a kit that includes all the pieces except your old cover if you just need the base of the umbrella. That means the overall look to your outdoor furniture set isn't compromised, but you have a functional, sturdy umbrella to enjoy again. You can also get bottom poles and clips. However, if you need to have your umbrella re-stringed, you'll have to send it in. There are also patch kits that allow you to iron on sections of material in order to repair your umbrella. This is a good choice for those with good umbrella frames but a damaged cover. You could also stitch a tear with a simple sewing kit or even glue, depending on the size and severity of the tear. Want to make scratches in your wood furniture less evident? There are kits that come with retouching crayons, which fill in and disguise scratches. Rockler has a Repair, Renovate, Revive kit. You can also use it on your indoor furniture to repair scratches, clean, fill nail holes, and more. You could also purchase a set of furniture markers like the ones at Harriet Carter. Find your perfect match and fill in the scratches.Normally the way the crayons work is by applying them with a putty knife, sanding them down, and then applying a top coat to blend everything together and effectively disguise the scratch or ding. For best results, consult the manufacturer's directions. An outdoor furniture repair kit can make what you may have considered destined-for-the-dump furniture back to useable condition. Sometimes all it takes is a quick fix to a vinyl strap, a minor repair to a cushion, filling in a scratch, or just a small missing part.